Dubai has inaugurated the world’s tallest twisted tower built at a cost of $272 million, setting a yet another record for skyscrapers and other engineering marvels. 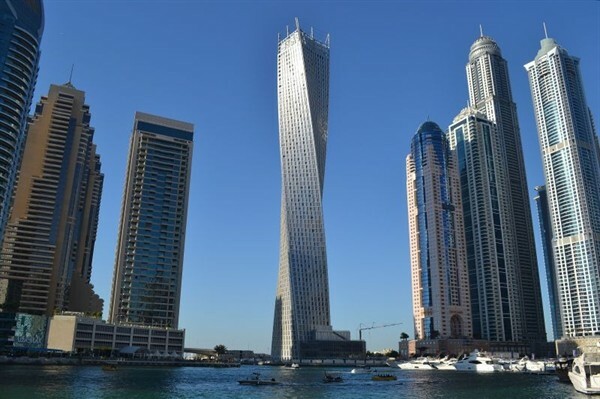 The 310-meter (1,017-foot), 75-floor residential Cayan Tower is twisted at 90 degrees from top to bottom and was inaugurated earlier this week in Dubai Marina — a man-made canal overlooking the Gulf. Developer Cayan Real Estate Investment and Development Company said 80 percent of its residential units have already been sold. The 828-metre (2,717-foot), 160-storey Burj Khalifa broke engineering and architectural records when it opened in January 2010. In May 2012, Dubai opened the 413.4-metre (1,356-foot) Princess Tower, the world’s tallest residential building, according to the Guinness World Records website. And later in 2012, the emirate inaugurated the world’s tallest hotel — the 355-metre (1,165-foot) twin tower JW Marriott Marquis Dubai. 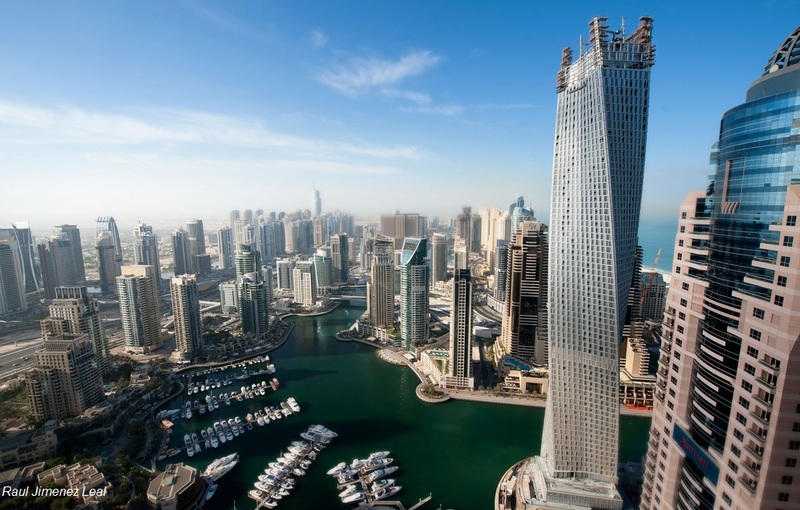 The Cayan tower (C), the world’s tallest twisted tower stands at Dubai’s Marina on June 11, 2013 in the United Arab Emirates. 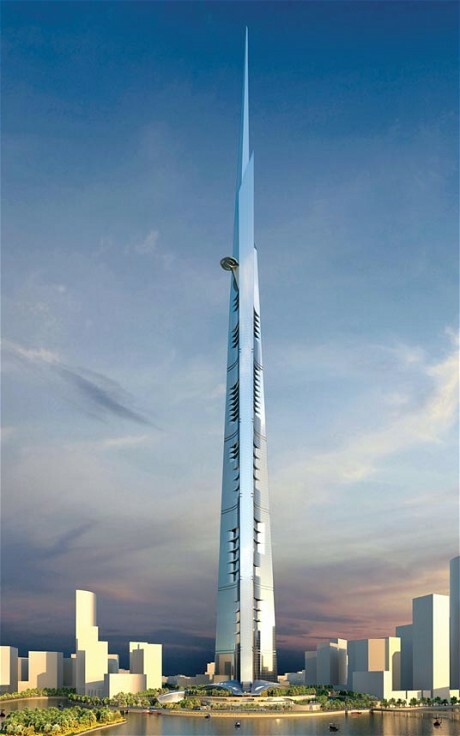 The world’s tallest building might be the sort of place you wouldn’t want to live. Sure, Sky City One, which will rise from an empty field in Changsha, China, will be a miracle of efficient construction that will be built in only 90 days, resist magnitude-9 earthquakes, and save energy just by allowing its residents to travel less. But as with all design compromises, those superlatives come at a price. In this case, it could be livability. All of the parts of Sky City One will be pre-fabricated in factories owned by Broad Sustainable Building (BSB). The company has already proved the technology in a 30-story hotel erected in just 15 days in Changsha, known as the T30. To get that speed, the hotel was built out of individual pre-fabricated blocks, like Legos. Now imagine 202 floors of “uncomfortably narrow” hallways and equally narrow individual living units. A look at the plans (below) for Sky City One reveal that the maximum width of each unit of the building will be just 3.9 meters, or 12.8 feet. That’s the width of a “single-wide” mobile home in the US. Save a dizzyingly tall interior atrium extending from the first to the 170th floor, any interior spaces wider than that will be interrupted by the steel columns that define the edge of each pre-fabricated unit. Zhang Yue, founder of BSB, has acknowledged that his building prioritizes efficiency above flashiness—this is no vanity project along the lines of Dubai’s Burj Khalifa, but an experiment in creating a new kind of vertical, and environmentally-friendly, urbanism. And China is home to countless strange and poorly-constructed buildings, so for many of Sky City One’s residents, their new home will be an upgrade from their current living circumstances. It may simply be that in a frugal future, this is the new face of “world’s tallest” structures—a transition from projects designed to awe to projects designed merely to put as many human beings in as small a footprint as possible. London could claim bragging rights for having the world’s tallest building after Saudi billionaire Prince Alwaleed bin Talal invited bids from big cities to build a mile-high skyscraper that would dwarf Dubai’s Burj Khalifa. The Saudi prince said he was in talks with Emaar Properties, Dubai’s biggest real estate developer, to team up with his investment firm Kingdom Holding on the project. “We are discussing and evaluating the possibility of building a one-mile (1.6km) tower,” Prince Alwaleed told Reuters. “I am now inviting the major cities of the world like Shanghai, Moscow, New York, London and regional cities in the Middle East to come and give their offers,” he said. If it is built, the tower will stand at double the height of the world’s current tallest skyscraper, the 828-metre Burj Khalifa in Dubai, as well as the one-kilometre-high Kingdom Tower now being built in the Saudi Arabian city of Jeddah. Prince Alwaleed said countries interested in hosting the world’s tallest tower would have to offer attractive financing terms, tax breaks and other government support. Experts have said building such a tall skyscraper would involve several engineering and design challenges. The design team of the Burj Khalifa conducted over 40 wind tunnel tests to determine the challenges the wind would pose on the construction process. The tower was built in a “Y” shape to cope with intense wind conditions. Engineers will also have to find a way to cope with the “stack effect”, which can cause major cracks in the foundation of a building if airflow is not managed properly. Prince Alwaleed did not say how the project would be financed if it went ahead, or when it might be completed. He said the cost had yet to be decided. The Kingdom Tower, which is project managed by London-based company Mace, is expected to cost around 4.6bn Saudi riyals (£788m) and will contain a hotel, as well as luxury flats and retail units. The structure is expected to reach ground level by the end of this year and to be completed in 2017.